Over the years, Fluidbook has become the leading name in the interactive catalogue sector. A Fluidbook is a unique, universal multimedia publication. A made-to-measure, all-inclusive service. After delivery, the files are hosted on your server so you can use them as you choose, without a subscription or time limitations. We can also provide custom enhancements including videos, animated graphics, custom tabs, etc. Discover all our services! Responsive web design and HTML technology, fully compatible with smartphones. Automatically adapts to PC, Mac, smartphones and tablets. Fluidbook loads each page separately and continuously. This means that while you are reading a page, the next pages are being loaded in the background. Flick through your documents by turning the pages over or by using the arrows. Fluidbook can be installed on any server and does not need a database. Just transfer your files via FTP and that's it! 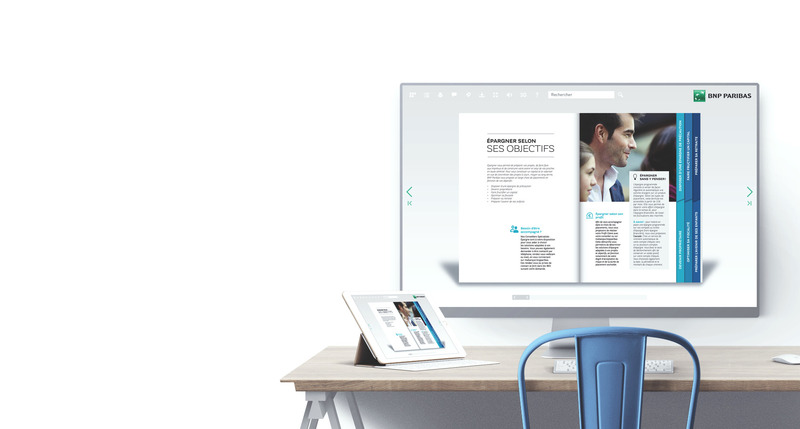 Whatever the size of your screen, Fluidbook will display your publication in the largest possible format and it can be enlarged by using the full screen button. Navigate easily to the page you want using our scrollbar, which has built-in preview thumbnails for each page. With just one click you can zoom in on any part of the page to expand to full screen. Simply use the mouse or your finger to move around the page. With a simple click, you can view the page spreads as a series of thumbnails and from there, directly access any page that interests you. You can send a personalised email to a friend using the “Send to a Friend” function. Sharing on Facebook, Twitter, Linkedin or Viadeo will increase your social media presence. You can print all or part of your Fluidbook in single or double page format at any time. You can download your publication in PDF format at any time. Unique 3D HTML5 technology enables realistic visual browsing. The rolling index is a true table of contents which gives direct access to the different pages of your Fluidbook. Start typing a word and Fluidbook will suggest and underline results on each page. All the links in your brochure to web pages or email addresses are functional in our system and are tracked by the integrated statistics tool. Your Fluidbook can include any type of file. With a simple click, viewers can download a logo, a press release or a collection of high-res images. All file formats are compatible. Place bookmarks on the pages that interest you and come back to them with just one click. You can also print or download these pages in PDF format. Your graphic charter, including colours and fonts, is reflected in the carefully adapted interface of each Fluidbook to create seamless communications. We are there to help you at every stage of your project, from the creation of the PDF file to the installation of the deliverable files on your server. All the text in your Fluidbook is retrieved for natural indexing by the major search engines such as Google and Bing. Fluidbook works with Google Analytics to give you access to one of the most powerful free statistics tools on the market. With a small parameter in the URL, the interface changes to the language of your choice! Fluidbook already exists in 23 languages and new languages can be added as required. We offer full support for right-to-left reading modes. We will also send you a small animated version of your brochure to put on your website. In addition to the web version, we will also deliver your Fluidbook in CD-ROM and USB key format to send to your existing or prospective clients. Your Fluidbook can contain videos embedded in its pages or display them as pop-ups. Just provide us with your film in any format and we will take care of everything else. You can integrate high definition slides into your publication. Would you like us to host your Fluidbook? No problem, our dedicated server will host your Fluidbook in the best possible environment. The tabs on the side of your Fluidbook provide direct access to the different sections. Add some music, a podcast or a specific sound - anything is possible! Publish your magazine online and limit the access to your subscribers! We can also disable the print and download functionality at your request. To bring your pages to life we can create custom animated graphics and headings. Tell us what you want or let us make some suggestions. A shopping basket can be embedded in the pages of your Fluidbook! With the audio description feature, Fluidbook reads each page aloud, making your publication accessible to the blind or visually-impaired. Present your publications as a library and offer your readers a single page containing all your catalogues, magazine archives, user manuals etc. Highlight an area of the page, a graphic, an image... which will open as an enlargement with a single click! Integrate your social feeds from Twitter, Facebook, etc, directly within a page of your publication. Your updates appear as a live stream and boost your visibility.